Jacques Villeglé (French, b. 1926) is a mixed-media artist and affichiste famous for his alphabet with symbolic letters and decollage with ripped or lacerated posters. He started studying architecture at the Ecole des Beaux-Arts, Nantes in 1947 but abandoned his studies in 1949 and moved to Paris. There he began to collect torn posters from the streets to construct pictorial tableaux, usually by mounting them on canvas. His work has primarily focused on the anonymous or marginal remains of civilization. 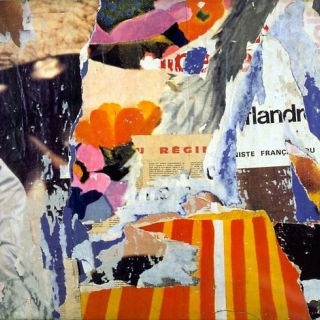 Villeglé held his first solo exhibition at the Colette Allendy Gallery, Paris in 1957, and signed the manifesto of the Nouveau Realistes in October 1960, confirming his association with artists such as Raymond Hains.